Matchbox Kitchen and BITA have handcrafted a special gift basket this Mother's Day to help you celebrate the women who light up your life. Our new basket comes with violet or yellow tulip trios, delicious and festive orange blossom or lemon watercolor cookies, and a handwritten note to the recipient. Our yummy cookies may last one sitting but our colorful blooms will bring sweet memories for mom year round! The last day to order our baskets is May 3rd. To place an order please go to the mk/bita tab on our website or click here! 2015 is here already, we can’t believe it! This year BITA is taking a new direction of which we are very excited about! Here at BITA we believe that life is continuous string of moments that are beautiful, inspiring and meaningful. These moments are the day to day special connection we share with others, the holidays and occasions where there is widespread celebration, and even the tough times where encouragement and healing is needed. Every moment in life is important and we hope for BITA to be a place where you can find the perfect tools to make any moment in your life and the lives of your loved ones meaningful. Thank you for being a part of this journey and stay tuned as we continue to grow and make 2015 and many more years meaningful! Celebrate handmade this holiday season with BITA and Matchbox Kitchen! We are teaming up once again to bring you a beautiful and delicious basket for the holidays! This time our basket comes with a handcrafted mistletoe, a yummy, organic smore kit and a personalized card from Clap Clap Designs. Our mistletoe comes in two colors, evergreen with silver glitter and moss green with red glitter, each handmade from European crepe paper and German glass glitter. Our two tasty smore kit flavors are vanilla bean and chocolate mint. On the beautifully designed Clap, Clap card we will be writing any message you’d like to include to your gift recipient. Two ship dates of December 10th and 17th are available. We hope these baskets bring you and your loved ones all the joy and warmth of the holidays! To order or find out more info go the mkbita tab on our website! Super Excited!!! Blooms in the Air will have a flower shop at Unique LA! This is big because it's the first time my flowers will meet and greet the public in person. I'm working hard to bloom as many blooms as possible. And as a result of it, I'm discovering new color combos and new forms with different techniques and materials. I will in the near future do a series on these new materials and techniques. However, for now, I'll have to make sure my first flower shop impresses the world. 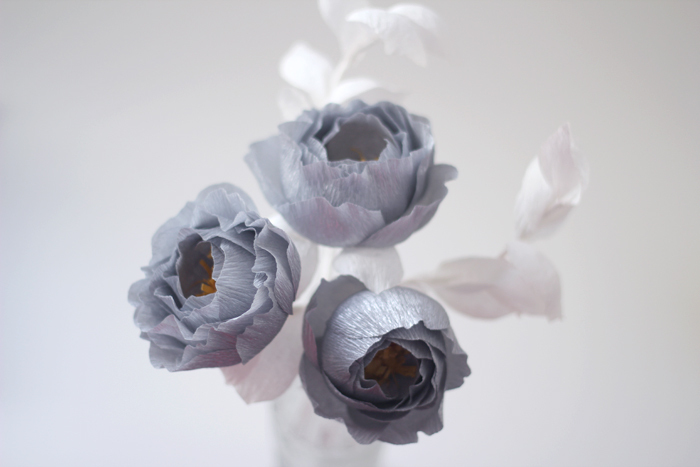 Here are snippets of couple of the new blooms. Enjoy! This Holiday Season is BITA's very 1st holiday season. So, I've crafted some Holiday inspired blooms. They are all in shop for you to enjoy at home. Hope it makes you smile.